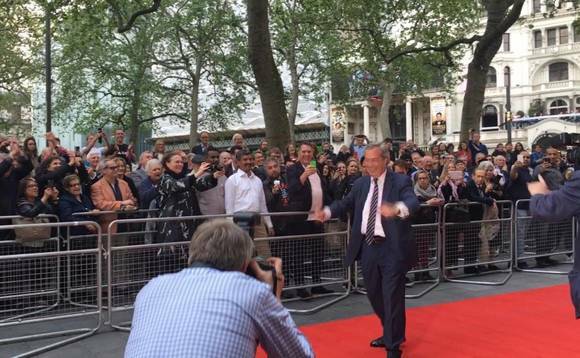 The Brexit referendum was given the red carpet treatment at a special London premiere, held in Leicester Square last week. Instead of Hollywood stars like Jennifer Lawrence and George Clooney, bemused onlookers had to make do with the likes of UKIP’s Nigel Farage and Labour’s Kate Hoey and a 70-minute film dedicated to the Brexit referendum debate. International Investment deputy editor Gary Robinson was at event click here for the video that appeared to be attended by more ‘leave’ campaigners than those backing a ‘stay’ vote. Claims of the film’s impartiality, which was directed by documentary film maker Martin Durkin and paid for through crowdfunding contributions, might be questionable, but Brexit: The Movie, is now available free of charge (click here), for anyone to watch and make up their own minds. The vote to decide whether or not the UK should stay or leave the European Union takes place on Thursday 23 June.